The Burg is a city for cyclists, runners, walkers — and even those who love scooters. Soon, we could see electric scooters all over the Sunshine City. City officials have recognized how energized this city is and want to help make the streets all over the city safe for those who want to cruise without a car. The program seeks to create more signaled crosswalks, wider bike lanes, in some instances protected bike lanes, and a readjustment of traffic patterns on certain streets. It’s an ambitious project that could make St. Pete one of the most cyclist-friendly cities in the country. 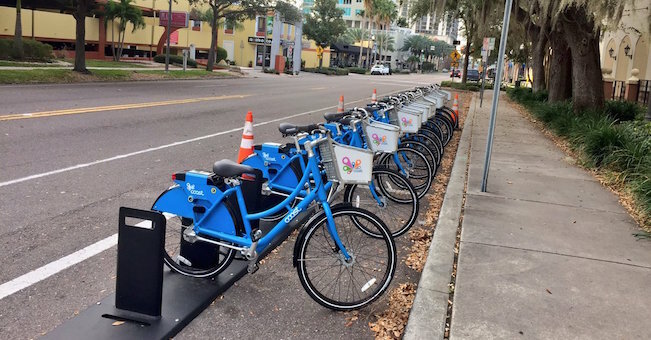 The proliferation of Coast Bike Share in St. Pete has shown a tremendous spotlight on how willing downtown residents and visitors are to traverse the Burg on two pedal-powered wheels. On Wednesday, December 14 from 6:30-8pm, the public is invited to hear the city’s recommendations for the Complete Streets initiative. This meeting will allow an opportunity to see an overview of the plan and provide final input on the recommendations before the plan is finalized. The meeting will be held at the Empath Health Community Room at 3050 1st Avenue South. *Full details on the Complete Streets program can be found by clicking here.